The term “negative space” is one of the first things you learn in art class, but it’s an innate concept. You’ve already seen it—you just needed a name for it. Oftentimes, negative space goes unnoticed. 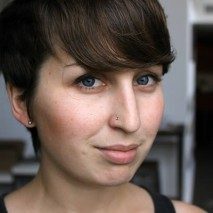 If it’s not adding anything meaningful to an image, then it might as well be invisible. But when this area is considered, it can transform how we look at something. The optical illusion Rubin’s vase is one of the most well-known examples of the power of negative space. When emphasized, an ordinary vase becomes two elusive portraits. Likewise, the FedEx logo looks much more interesting when you realize its secret hiding in plain sight: the space between the “E” and the “X” form an arrow. 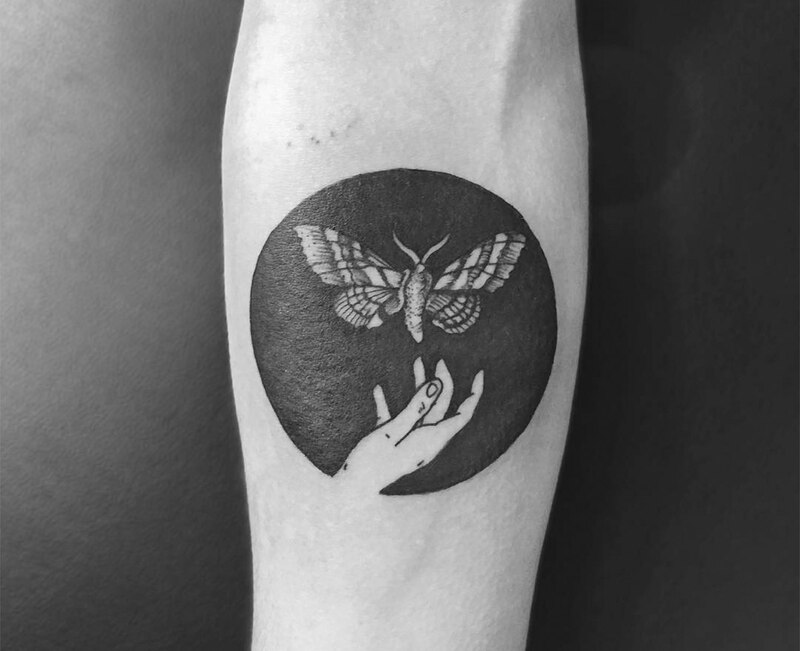 Here are 10 artists taking the concept of negative space and highlight it in their tattoos. 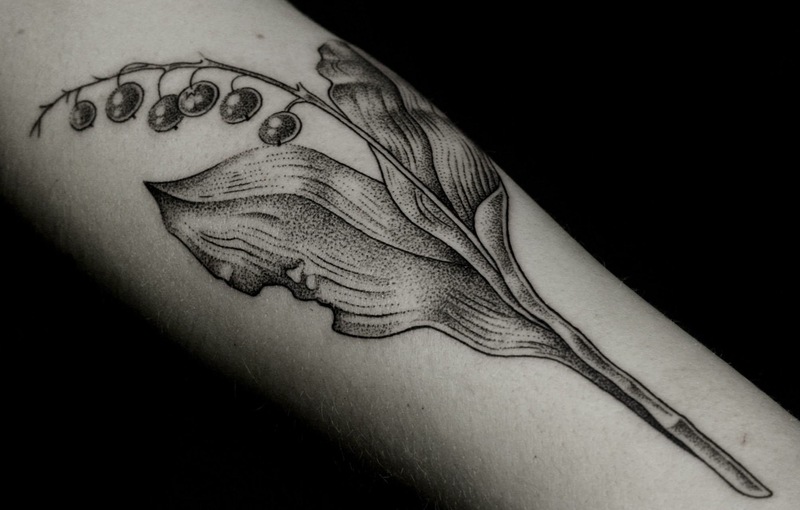 Above: Matt Cooley blends contemporary with traditional in this romantic tattoo. 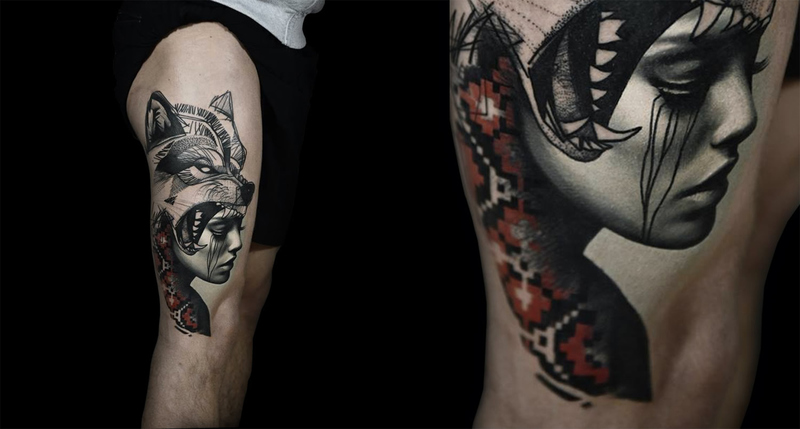 Aside from negative space, some of Dotyk’s latest tattoos create an illusion that they’re emerging from within the body. 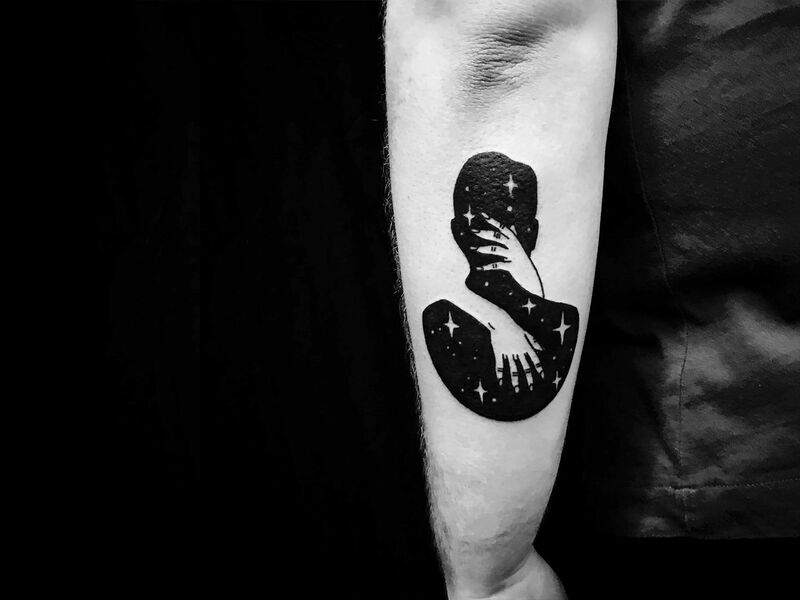 Dotyk, aka Pawel Indulski, is known for his minimalist-style tattoos that incorporate stippling to form bold shapes within negative space. Here, his design happens to be similar to the Women’s March logo—although this tattoo was produced well before the march took place. 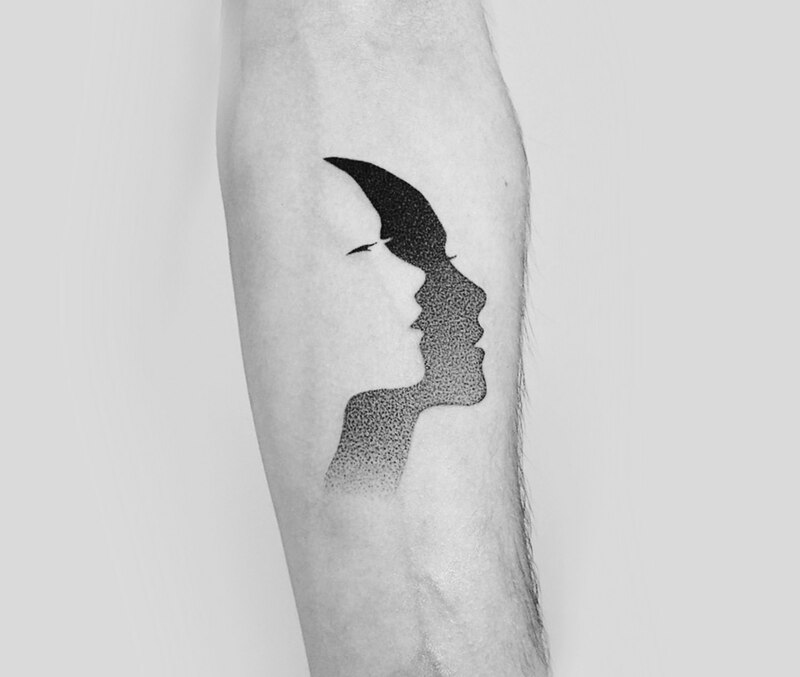 In both Dotyk’s tattoo and the activist branding, they capture the anonymity that negative space brings. The figures are blank slates that allow us to imagine anyone in their place. 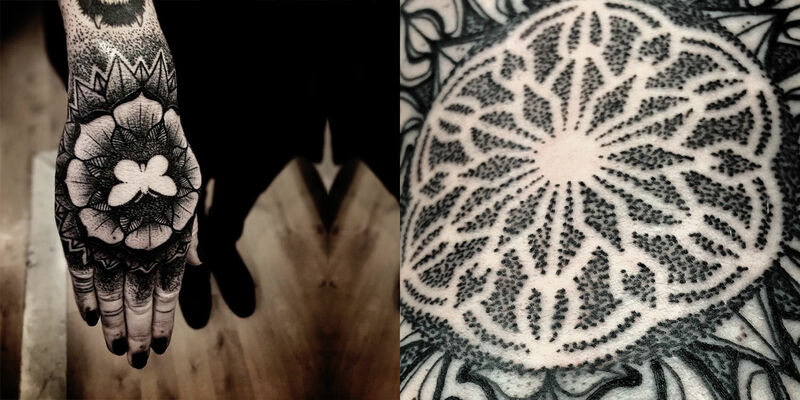 Gakkin’s work is the star of the short film “Gakkin Tattoo,” which intersperses his tattoos with dark imagery. Ville Prinsen works out of Unikum Tattoo in Gothenburg, Sweden. 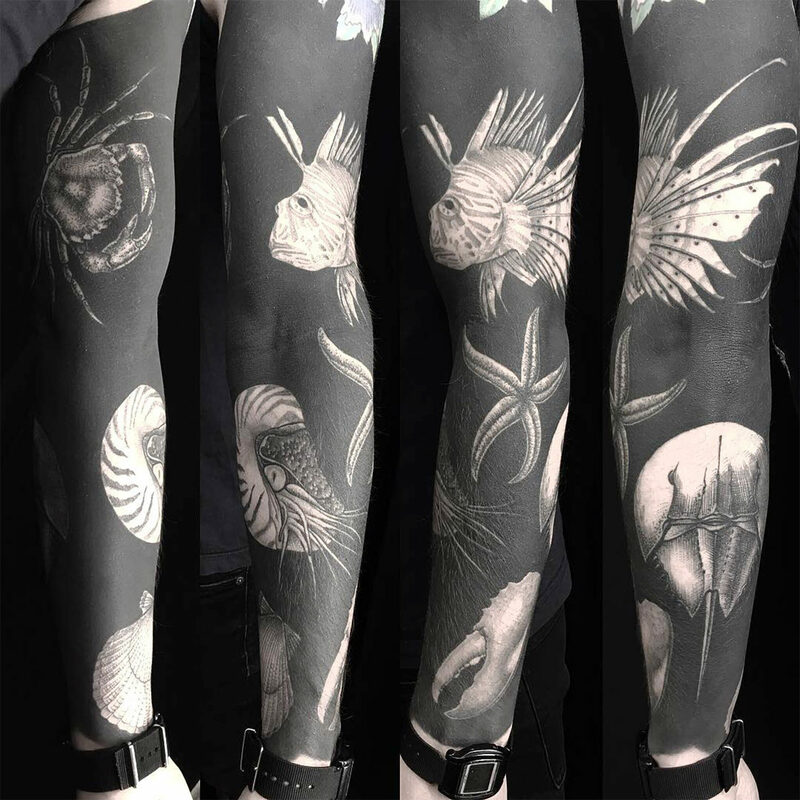 Calling this his “creature sleeve,” artist Ville Prinsen incorporated one of his favorite styles—blackwork—into the design. The nearly-blackout approach sets the stage for these under-the-sea figures. When looking at his client’s arm, it’s as if the creatures have fallen into the depths of the ocean where there’s very little light. 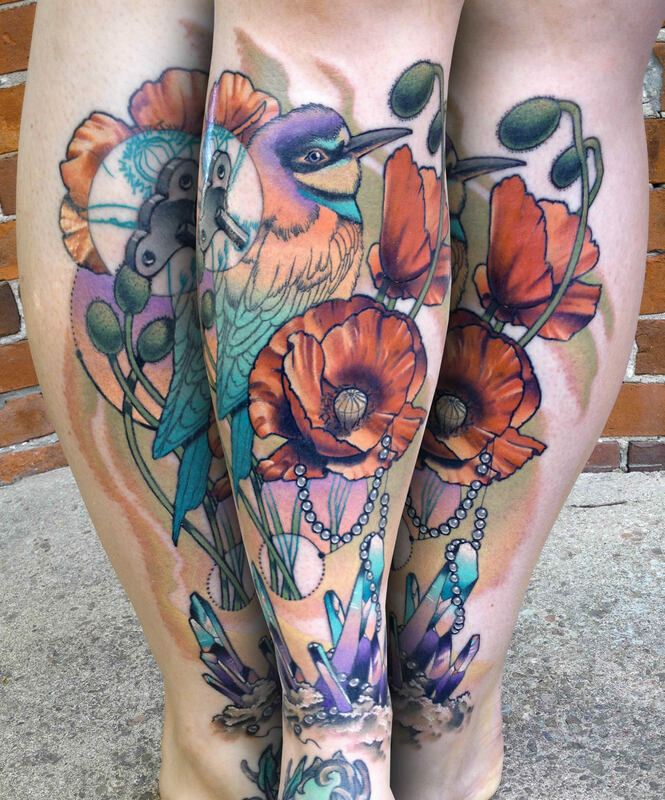 This tattoo is a departure from much of his portfolio, however, which mostly incorporates smaller, single subjects like insects, animals, flowers, and mandalas. 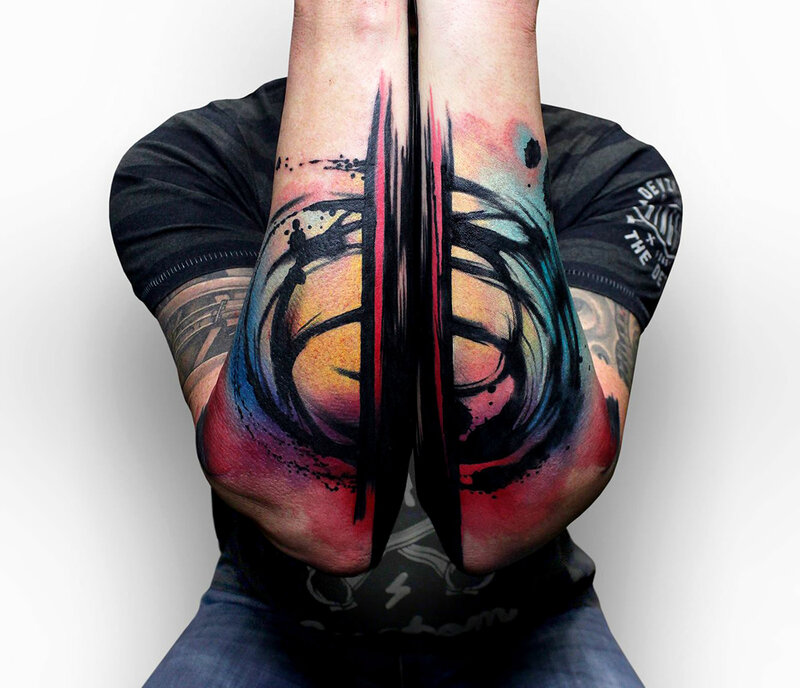 In another negative space tattoo, it looks like Melkiov has burned a hole in someone’s skin. 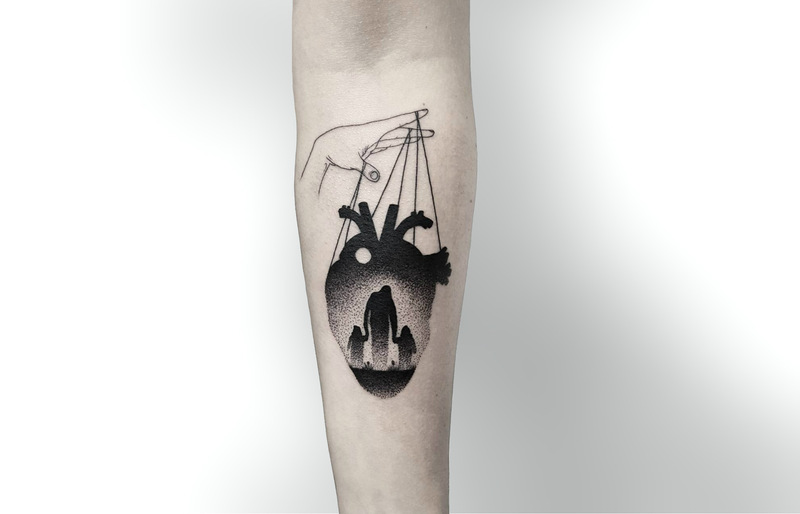 Russian tattoo artist Roman Melnikov imitates smoke on skin, and its ethereal drifts linger to seemingly hover over the skin. Here, Melnikov has cleverly used negative space in such a way that it hardly feels like use of it at all. 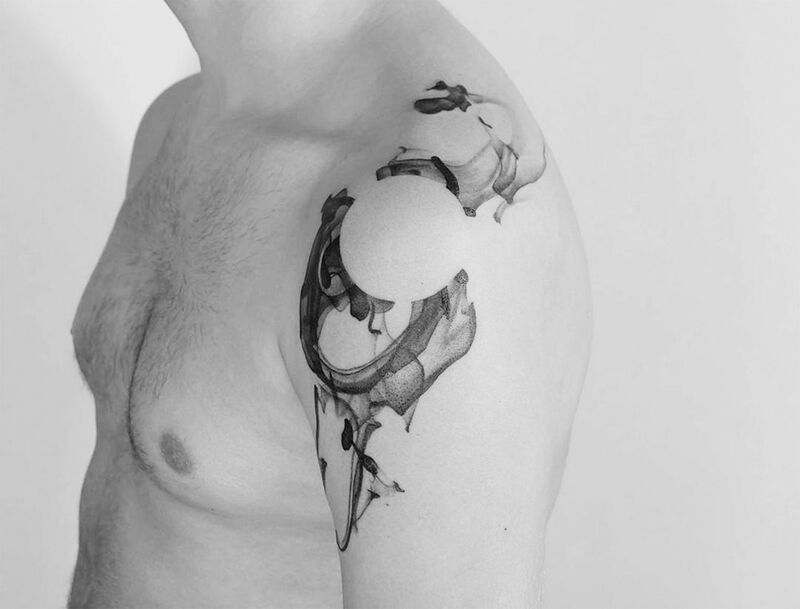 The minimalist tattoo implies the outline of a perfect circle as the soft waves surround it with luscious shades of black. Although based in Moscow, Melnikov is taking these talents on the road. In June, he’s traveling to Asia and will be in Hong Kong and Beijing. Tomtom’s fantastical vignettes are reminiscent of tattooist Eva Krbdk’s tiny work. 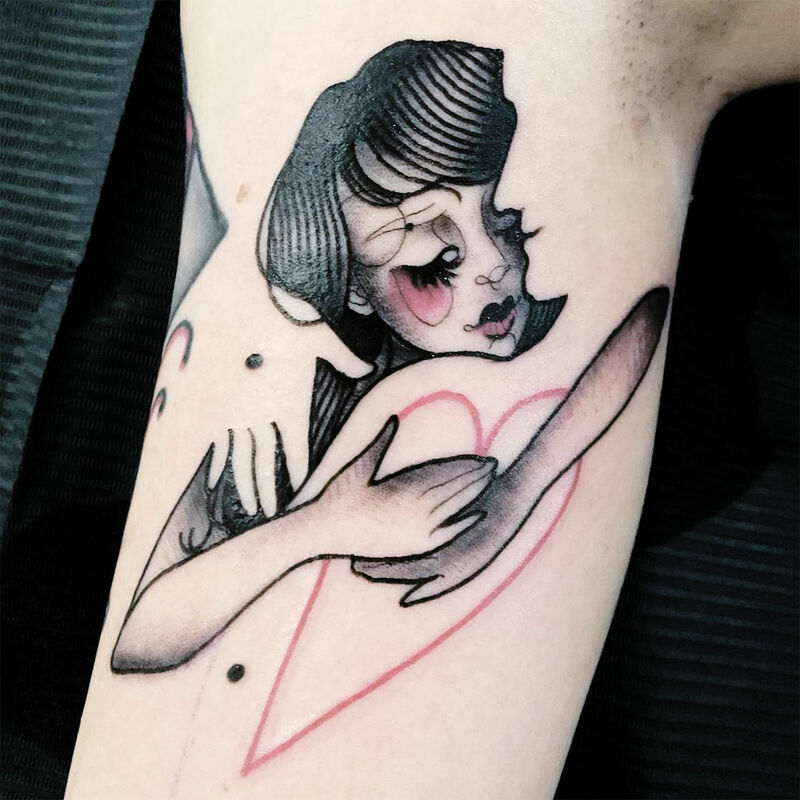 Glasgow artist Tomtom Tattoos specializes in small vignettes that tell a story. From climbing a ladder to the moon to enjoying the stars, an application of rich black ink puts his subjects front and center. These sort of often-fantastical tales is part of his pen art as well, and his use of small, meticulous line and dot work gives both his drawings and tattoos the feeling of vintage engravings. Does one bad apple ruin the bunch? Matt Cooley asks it in this deceptively simple tattoo. 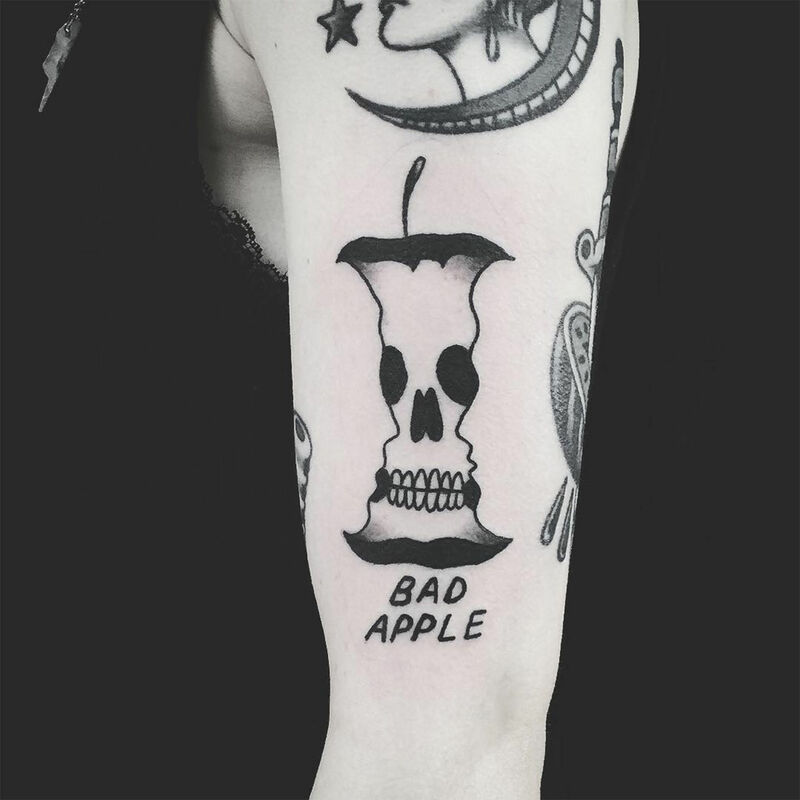 Matt Cooley puts his own spin on Rubin’s vase with this “bad apple” tattoo. But rather than a vase appearing between the two silhouettes, he’s incorporated a traditional-style skull—implying that this person was rotten to the core. 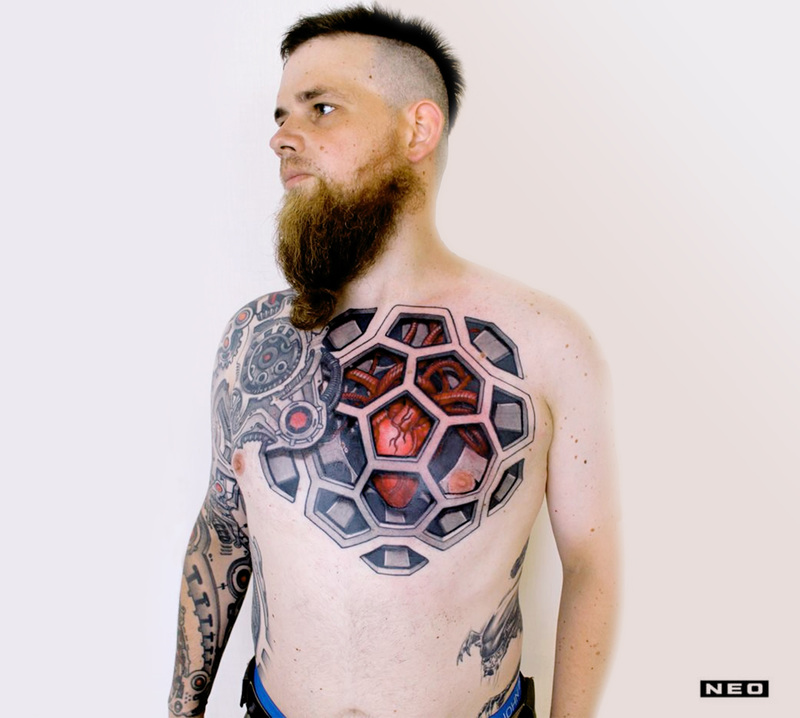 It’s a simple, clever, and amusing piece of body art, that’s made more sophisticated with the additional of the optical illusion. 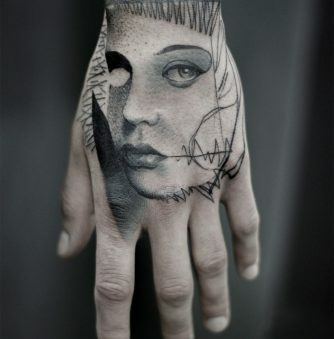 And as Cooley shows again, a small illusion can subtly elevate a seemingly straightforward tattoo. 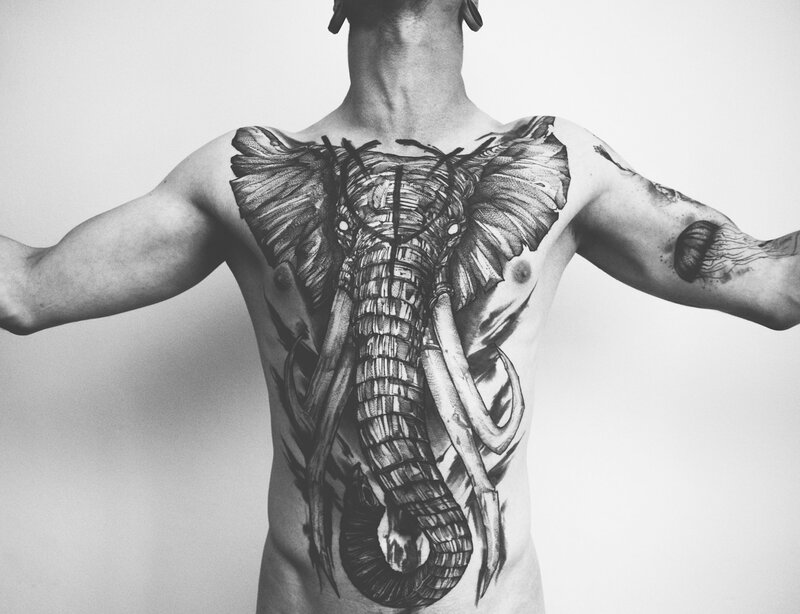 In addition to patterns, Victor J. Webster also excels at large tattoo portraits of animals from around the world. 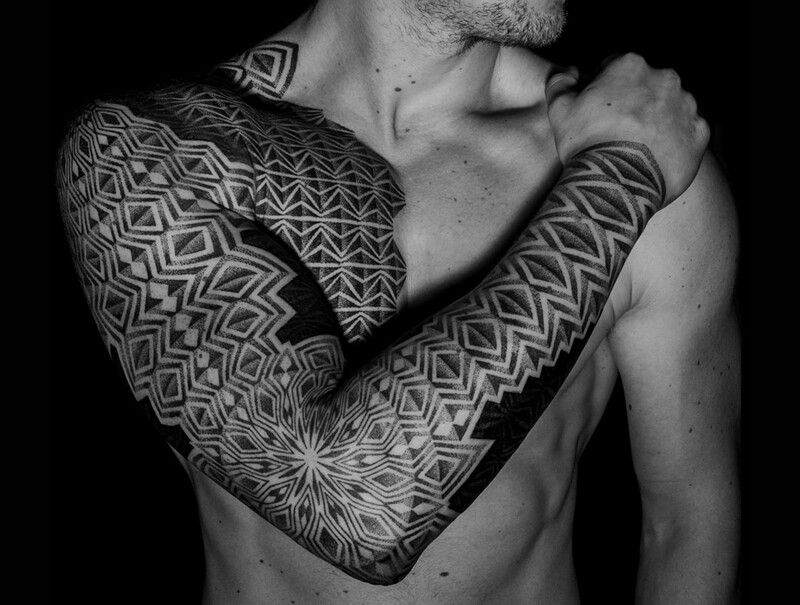 Victor J. Webster writes that he “fell in love with Pacific Island tattoos at an early age,” and says that his work is “tied to the Pacific Ocean, whether from Polynesia, Indonesia, Micronesia, Japan, and Southeast Asia.” Patterns are a large part of his tattooing portfolio, and he inks traditional Pacific Island motifs onto the skin. 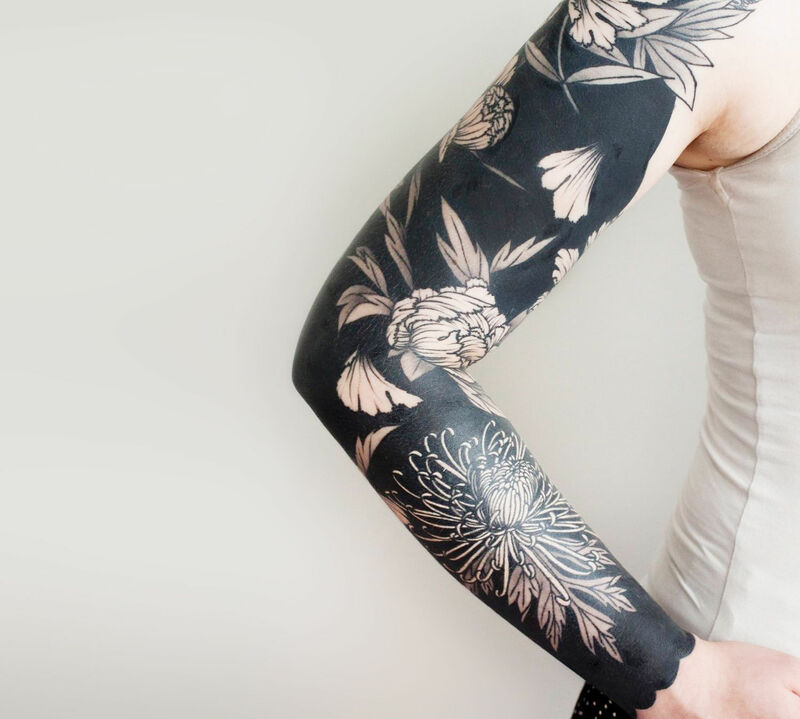 Here, he’s cleverly integrated a bold design into the rest of the arm by gradually removing parts of the design, so that piece by piece, it fades away. In the rare times that Mike Wolf doesn’t incorporate the mandala into his work, he still incorporates a powerful symbol—such as the sun. 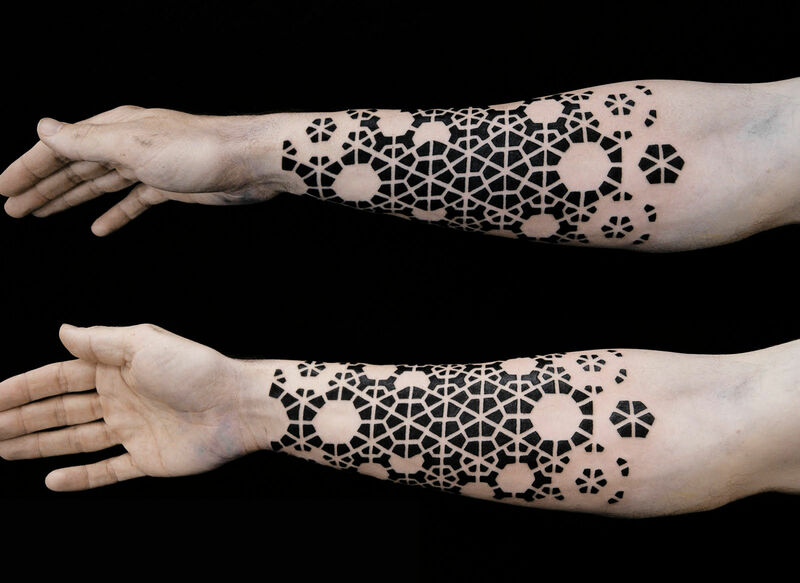 Based in a private studio in Germany, Mike Wolf incorporates mandalas and mandala-inspired designs into much of his creative life. 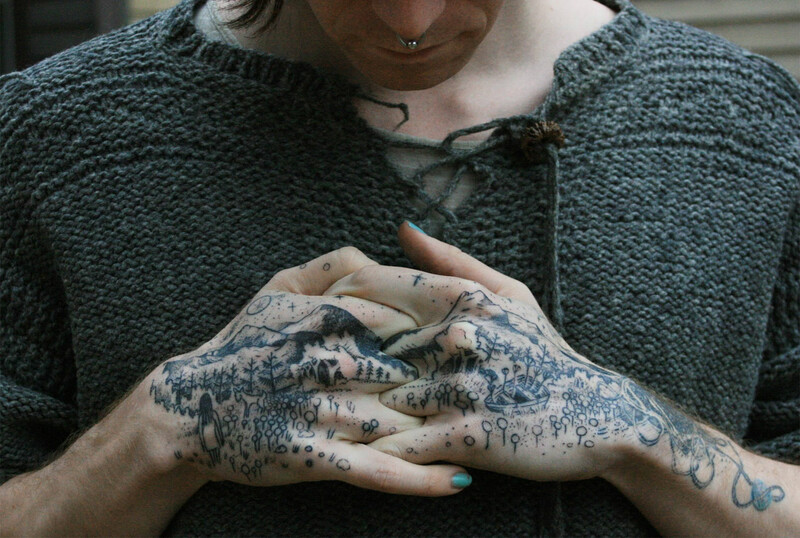 They’re seen in many of his tattoos as well as his linocut printmaking and t-shirt line. But no matter the medium, the sweeping curves and concentric circles are made with the solid geometric shapes, proving that what’s left out is just as important as what’s added in.